We have just settled into our new Hostel. It is fairly nice. We are staying on Main Bazar near the New Delhi Train station. The street is a market street, full of stalls. Yesterday was a much better day for us both, as we had a better idea where things were and we also didn’t let the touts get to us. We had a nice sleep in to catch up with sleep and then we went to book all our trains up until Mumbai. 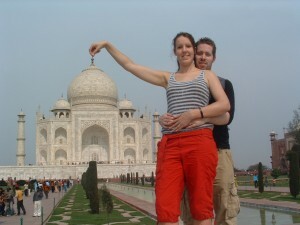 Then we booked our accommodation up until Monday, when we leave for Agra. Yesterday we visited India Gate and also the house of Parliament. When we arrived at India Gate a group of about 20 school kids came up to me asking for my picture. I thought this was funny so I just agreed. Then another group of people also asked could they get there picture taken with me. I said I’m not famous! They just wanted their picture taken with me because I was Foreign, they said. I think it’s also because of my height. It is unusual to see anyone my height here, let alone a woman. People really do stare at us. I think we need to work on blending in more. You can tell travellers who have been travelling for while, as they start to blend into the background more. We will work on this! You’ll be pleased to know Paul is still fixing problems. Yesterday a guy’s car broke down on a busy main street in New Delhi. Paul and another guy helped push the car to get it started again. He has been tempted on several occasions to help locals who are busy working on the paths here. They are trying to get the place ready for the Common Wealth games, which will be in New Delhi this year. They will be lucky to get it complete in time, with the manual labour only. They have not got heavy machines like we do! Today we are heading to see the Red Fort, ISKCON temple and the Lotus Temple, which looks very similar to the Sydney Opera House. Then later on we are visiting the Garden of Five Senses. I will tell you more about these places, once we have visited them. We arrived in New Delhi 4 hours behind schedule. We had read on the Internet that you could get metro from Delhi airport to the city center. Well this is true, except it hasn’t been built yet! So we got a pre-paid taxi instead, which cost us 250 Rupees (3.43 GBP) for a 17 mile journey. You need to make sure you get the Pre-Paid taxis, as others will try and charge you more! You can pay for your Pre-Paid taxis inside the airport. We got to our hotel fine. It is nice enough, but the bathroom is, well interesting! Paul was right we should of brought toilet roll:) They told us there was Wi-Fi in the hotel, but there wasn’t any internet at all! I guess this is just a way for them getting you to stay! We will be checking in future! So after settling in we decided to brave New Delhi City. This can’t be too hard I thought. My Dad had warned me about the touts, but I didn’t think it would be this bad! As soon as we left our hotel we had people trying to coax us to going to a tourist information. We just thought they were trying to be helpful at first, until we found that when we got to the tourist information, they sit you down and try to sell a package of train tickets to you! We decided not to let them bother us anymore. However we then went to Mc Donalds (Yes Paul has already persuaded us to go there) and sat down. Two guys came over and asked if they could take a spare seat. We said no problem. After a while they asked us where we were from and then we just got chatting and they told us about different things in the city. I guess this was to build up our trust. They told us to avoid the touts and only to use a company called ‘Incredible India’, which we had previously heard on the internet. After showing us where it was we were back inside another ‘tourist office’ trying to sell us a package of train tickets for 250GBP each. Today we got this same package for 30 GBP each from the New Delhi Train station. When you go inside the train station it is upstairs on the first floor. I will warn you the touts will try direct you away even when you arrive at the station. Trust me, we went round in circles yesterday! Well we’ve learnt our lesson! Today we booked our trains from New Delhi to Agra for Monday 8th February. We will stay there one night, then we head to Jaipur on the 9th for two night. Then we leave for the overnight train from Jaipur to Mumbai on 11th. 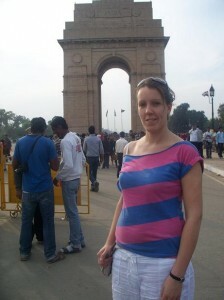 Today we will be looking at the sites in New Delhi.